Degenerative disc disease is a common source of chronic pain in the lower back. The spine is made up of a column of stacked bones called vertebrae. Flat, gel-like discs that provide cushioning between the bones separate the vertebrae. The discs are made of a tough outer layer, called the annulus fibrosis, and a jelly-type center, called the nucleus pulposus. As we age, the discs begin to deteriorate, most commonly by drying out and shrinking. This reduces the disc’s flexibility and height. 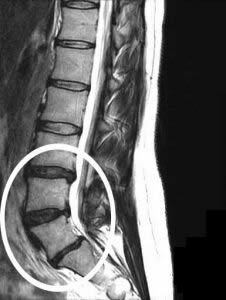 As a result, the weakened disc cannot hold the vertebrae together as well as it could previously. Unlike muscles or other body tissues, discs do not have the ability to heal themselves. The disc degeneration can lead to instability in the spine, where the spine can no longer bear the patient’s weight or perform normal activities without severe pain. In addition, as a result of the collapsed disc the foramen may become secondarily narrowed, giving rise to radiculopathy. For some, the condition may not cause any pain or symptoms. The spine experts at Midwest Orthopaedics at Rush Minimally Invasive Spine Institute commonly see patients with degenerative disc disease experiencing lower back pain. Most often, sitting worsens the pain, since the discs experience three times as much loading while seated compared to standing. Patients may also experience increased pain with bending, twisting and lifting movements. For some, the pain is less during walking or running than during prolonged standing or sitting. Some may also feel a burning, tingling, or numbness running from the lower back and buttocks down through the legs. The risk of having degenerative disc disease increases with age. At birth, water makes up 80 percent of the discs. As we age, the discs in our spine lose water and elasticity. Once this occurs, they don’t absorb shock and movement as well. The condition may also occur as a result of a twisting injury to the lower back, such as during a golf swing. Sudden, acute injuries such as a fall may cause the outer layer of the disc to tear or crack, causing it to bulge, rupture or break into fragments. Degenerative disc disease is fairly common in patients over age 60, simply from the wear and tear on the discs over time. In cases where patients have minimal or manageable pain, physicians at Midwest Orthopaedics at Rush treat them through conservative, nonsurgical options. The first line of treatment is activity modification to avoid lifting heavy objects and limiting painful activities. Physicians may recommend anti-inflammatory pain medications or steroids to treat severe pain. Physical therapy or a consistent exercise plan may also be suggested and could include low-impact aerobic conditioning, lumbar stabilization exercises, back strengthening, and hamstring stretches. If a patient does not improve after non-surgical treatment or if the case is severe, Dr. Singh may suggest surgery as a solution for degenerative disc disease. The goal of surgery is to reduce pain by removing the degenerated disc. The suggested surgical procedure for degenerative disc disease is lumbar fusion.